Joseph “JoJo” Diaz (26-0, 14 KOs) successfully defended his NABF and NABO Featherweight Titles with a dominant third-round knockout victory against former world champion Victor “Vikingo” Terrazas (38-5-2, 21 KOs) in the main event of the Feb. 22 edition of Golden Boy Boxing on ESPN at Fantasy Springs Resort Casino in Indio, Calif. After dropping Terrazas twice in the first round, Diaz, Jr. continued punishing Terrazas to the head and body before finishing the fight with a left hook at 3:00 of the third round. 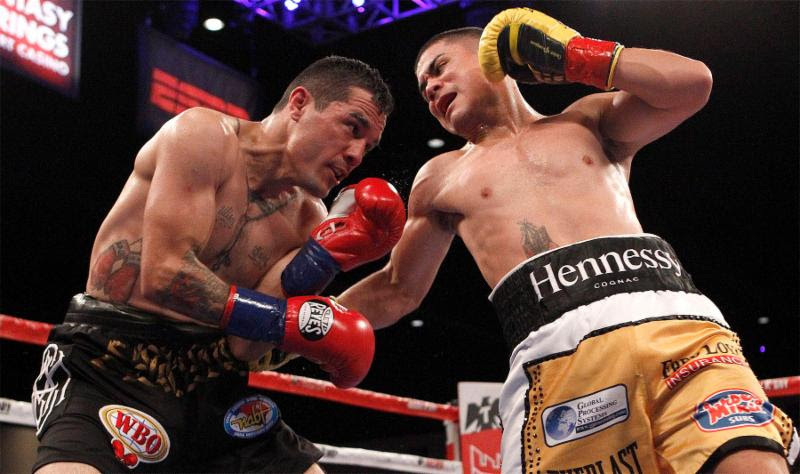 Diaz, Jr. maintained his status as the No. 1 contender for the featherweight championship of the world with this impressive victory. In the televised swing fight, Filipino standout Rey “Flash” Perez (22-10, 6 KOs) scored a tough but clear unanimous decision victory against Christian “Chimpa” Gonzalez (18-2, 15 KOs) in a lightweight fight. Perez dominated Gonzalez in every round, landing hard shots easily though Gonzalez’ guard. Perez won with scores of 79-73, 79-73, and 78-74. Genaro “El Conde” Gamez (7-0, 5 KOs) of San Diego, Calif. scored a technical knockout victory against Miguel Mendoza (23-14-2, 11 KOs) of Aguascalientes, Mexico at the end of the fourth round of a scheduled eight-round super lightweight fight. Super Featherweight prospect Hector “El Finito” Tanajara, Jr. (12-0, 5 KOs) of San Antonio, Texas scored a first-round knockout victory against the Mexican pugilist Eduardo Rivera (10-4-2, 4 KOs). Tanajara, Jr. wasted no time in landing a lead right uppercut that immediately hurt Rivera, which he followed with a flurry that ended matters at 1:58 seconds of the first round. Los Angeles, California’s Manny “Chato” Robles, III (15-0, 7 KOs) scored a fourth-round TKO victory against Martin Cordona (24-11, 16 KOs) of Tucson, Arizona in a featherweight fight originally scheduled for eight rounds. After Robles punished Cordona for several rounds, the fight was stopped at 2:53 by the latter’s corner. Diaz, Jr. vs. Terrazas was a 10-round fight for the NABF and NABO Featherweight Titles presented by Golden Boy Promotions. The event was sponsored by Tecate, “THE OFFICIAL BEER OF BOXING” and Hennessy, “Never Stop, Never Settle.” The fights took place on Thursday, Feb. 22, 2018 at Fantasy Springs Resort Casino.